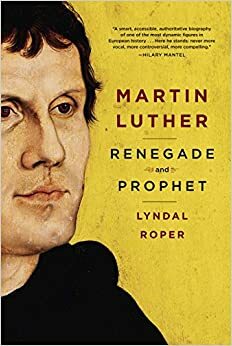 Dr. Martin Luther was a great Reformer, but as Lyndal Roper pointed out in her book, ” Martin Luther: Renegade and Prophet,” he was very much a human being, with all the virtues and vices that go with that. Martin Luther was born in Eisleben, Saxony, on St. Martin’s Day ( the tenth of November), 1483. His father, Hans Luder, ran a mining business and his mother, Margarethe Lindemann, was a daughter of minor nobility. Hans Luder had his fair share of labor troubles with his workers and he intended for his son to study law. Martin Luder was duly schooled with that aim in mind. He grew up in the town of Mansfeld, not far from Eisleben. Ms. Roper spends some time describing Luther’s schooling and put some detail in how he was educated and his eventual disenchantment with the Law. Martin’s father, of course, was furious at the thought of his son’s not getting a law degree, after all the money he spent with that objective in mind. Ms. Roper spends quite some time in describing the psychological states that the Reformer and his acquaintances found themselves in and how those states dictated their responses to each other. Martin Luder changed his name to Eleutherius ( the Liberated One) and later condensed that name to Luther as a nod to the Classical fashion popular among the literati in the Holy Roman Empire at that time. Ms. Roper spoke of the stormy passions that assailed Luther, his loathing of his enemies and his love for his friends. He was utterly determined that the Roman Catholic Church root out the corruptions that had infiltrated it, especially on the issue of indulgences. She also wrote of Martin’s compulsion to spend hours in Confession ( along with his Confessor’s desire for him to shift his focus from himself and work). Martin’s Confessor, Johann Staupitz, and he were fast friends for years. Martin earned his master’s at Erfurt and following Staupitz’s advice, pursued an academic career as a doctor of theology at the nascent University of Wittenberg. Staupitz followed Martin’s subsequent career as a churchman quite closely and the two finally parted ways when Staupitz refused to renounce Rome, despite Luther’s insistence. Martin was not able to have Pope Leo X call for a General Church Council to discuss the concerns that Luther and others had over ecclesiastical corruption and he was excommunicated a couple of years after he posted his Ninety- Five Theses. Ms. Roper spoke of Martin Luther’s relationships with Karlstadt, Zwingli, Eck and others. She also spoke of the vitriol with which Luther wrote about these men who differed with him on key points of theology. She also noted some of the things these men wrote about Luther himself. Martin tended to go overboard when one of his fellow academics publicly disagreed with him. Roper records the time Luther gave Karlstadt a bent gold coin, for him a declaration of enmity and for Karlstadt permission to write his opinions about Luther and his theology as he saw fit. Roper wrote of the vengeful response of Luther when he heard of Zwingli’s death on the battlefield at Kappel. She also describes Zwingli’s death in brisk detail. M.L. wrote just as vengefully against Thomas Muntzer and the peasants during the Peasants’ Revolt. As Luther was fond of writing, his father was a peasant, but what he omitted was that his peasant father did well enough for himself to own a mining operation and to marry someone of minor aristocratic descent. Luther was solidly on the side of the princes and dukes these peasants revolted against. They were, in fact, inspired to a great degree by Luther’s own preaching. His defiance of the powers of the day served as a catalyst for them. At M.L.’s encouragement, this rebellion was put down by the nobles with fire and sword. Muntzer himself was captured and executed. On the subject of execution, Roper pointed out that Martins’s life was very dependent on the goodwill of his protectors who lived in the Saxon Elector’s court, as well as his most powerful protector, the Elector himself. Luther’s life was endangered for most of his life and his contributions to the Reformation were largely literary. Justus Jonas, Johannes Bugenhagen and Phillip Melanchthon implemented the Lutheran Reformation in those towns and cities who were in sympathy with it. Luther married an ex- nun, Katharina von Bora, who was determined to marry him. She was a formidable Reformer in her own right, supporting her husband and managing the household almost single- handedly. Luther lived and worked at Wittenberg for most of his life, fathering three children and preaching about various books of the Bible, all of which he translated into German and published. Martin’s German Bible, in fact, provided the Saxon base for the High German language used today. He also wrote the Small and Large Catechisms as well as the Articles of Schmalkald, which are three vital Confessions used by the Lutheran Church today. Roper’s book is an excellent analysis of the life and times of Martin Luther. She wrote of his frequent ailments, his stresses, his friends won and lost and his desperate attempts to bring the Gospel back to the Church. Martin died very peacefully, in Eisleben, in 1546, after unsuccessfully trying to resolve a dispute between businessmen. Roper’s book is a very engaging one and almost impossible to put down. Anyone interested in the life and times of this most remarkable Doctor of the Church, Martin Luther, would be well- advised to read it.